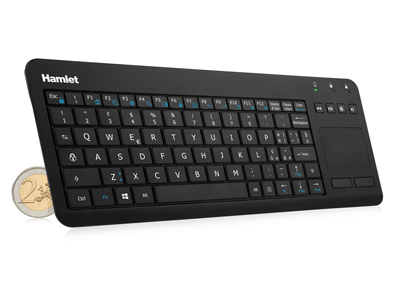 Hamlet Wireless Smart TV Keyboard is a compact keyboard with a touchpad and two buttons for convenient control of the mouse able to communicate wirelessly thanks to the 2.4GHz RF wireless technology. It is the ideal solution to comfortably control devices such as Smart TV, Projectors, Media Center, Computer, Tablet PCs and Smartphones. The keyboard works with two common AAA batteries that provide extended use of the device and includes a nano USB receiver for the wireless connection. * Some features may be limited in certain devices and/or operating systems.